Snow chains are an joined chain device that are attached to the drive wheels of a vehicle to get traction on snow covered roads. Chains are sold in pairs and must be purchased to match a particular tyre size. Using our search facility below, enter your tyre size (found on the sidewall of your tyre) and we will show you the appropriate chain products for your size. Chains may not be suitable for all vehicles as different chains require different amounts of clearance between the tyre surface and the under-arch components. Trial fitting chains to your vehicle before driving on them is advisable for several reasons, but mainly to ensure you have suitable arch clearance and also to ensure you have ordered/recieved the correct chains. Vehicles that have low clearance (Some coupe and sports models with larger wheels) are recomended to use Snow Socks instead of snow chains. Driving with chains will significantly increase traction under breaking and acceleration and will make the vehicle react to the conditions far more predictably, chains will reduce fuel efficiency and can reduce the speed of the vehicle to approximately 30 mph (50 km/h) but will allow you to use your vehicle in up to a foot of snow (depending on the chain). Snow chains can take 10 minutes or more for first time users to fit, and down to about 6 minutes for a more experienced user. 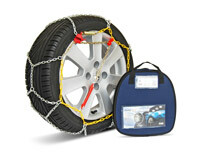 Snow chains are fitted by sliding the unbinded length of mesh chain centrally under and behind the wheel. Then by pulling the chain up and joining the loop at the back of the wheel, front fasteners are then connected and pulled tight with a torsion device.